Early in the Gold Rush, miners used shovels and other simple tools to scoop up river gravels. The easy gold was soon picked clean. The challenge took on new proportions: millions of tons of earth had to be dug up and sifted. California mining engineers thought BIG, the floating gold dredge was one idea. Imagine a long string of giant buckets like this one. Imagine one hundred forty of them on an endless moving bucket line of a floating dredge in the Yuba gold fields. Each bucket is filled with eighteen cubic feet of river gravel, digging over fifteen thousand cubic yards of earth -and a tiny bit of gold-each and every day! They dig down as deep as one hundred-seventy feet. The dredge operates day and night, stopping only one hour each week for maintenance. The gold was separated on the barge. The waste, called tailings, was tossed out along the bank. Mountains of tailings piled up, sometimes as tall as a seven-story building. Today, you can still see these immense, barren mountains of waste rock as you drive through parts of the Sacramento Valley. So how much gold do you think a gold dredge produced? Look closely. Here is the average amount of gold from one bucket load--about one hundred twenty-five milligrams. It took two hundred fifty giant buckets filled with river rocks and gravels to produce just one ounce of gold. No wonder these waste piles of rock are so huge. 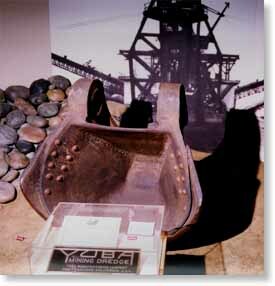 A single Yuba dredge operating between 1918 and 1926 excavated 26 million cubic yards of river rock and soil, and produced over seven million dollars of gold. And what does that much earth look like? Imagine a big block of rocks, as high as a two-story house, and as big as a football field. Now imagine 100 of them side by side. That is how much soil and rock was pulled up and spit out by that dredge each year, for the eight years it was in operation.